The new prime suspect (Smithman) was first singled out by detectives in 2008. Their findings were suppressed. Insight reports.
? MS avait signalé Smithman fin mai 2007, mais la PJ, qui cherchait des éléments pouvant incriminer Robert M, alors suspect numéro un, ne s'est pas beaucoup intéressé à Smithman. Pourtant, comme la PJ faisait peu de cas de Tannerman, elle aurait pu au moins se servir de Smithman, qui portait une enfant très semblable à MMC, pour écarter Tannerman qui, au départ, ne portait que peut-être un enfant. The critical new evidence at the centre of Scotland Yard's search for Madeleine McCann was kept secret for five years after it was presented to her parents by ex-MI5 investigators. The evidence was in fact taken from an intelligence report produced for Gerry and Kate McCann by a firm of former spies in 2008. It contained crucial E-Fits of a man seen carrying a child on the night of Madeleine's disappearance, which have only this month become public after he was identified as the prime suspect by Scotland Yard. A team of hand-picked former MI5 agents had been hired by the McCanns to chase a much-needed breakthrough in the search for their missing daughter Madeleine. But within months the relationship had soured. A report produced by the investigators was deemed "hypercritical" of the McCanns and their friends, and the authors were threatened with legal action if it was made public. Its contents remained secret until Scotland Yard detectives conducting a fresh review of the case contacted the authors and asked for a copy. They found that it contained new evidence about a key suspect seen carrying a child away from the McCanns' holiday apartment on the night Madeleine disappeared. This sighting is now considered the main lead in the investigation and E-Fits of the suspect, taken from the report, were the centrepiece of a Crimewatch appeal that attracted more than 2,400 calls from the public this month. One of the investigators whose work was sidelined said last week he was "utterly stunned" when he watched the programme and saw the evidence his team had passed to the McCanns five years ago presented as a breakthrough. The team of investigators from the security firm Oakley International were hired by the McCanns' Find Madeleine fund, which bankrolled private investigations into the girl's disappearance. They were led by Henri Exton, MI5's former undercover operations chief. Their report, seen by The Sunday Times, focused on a sighting by an Irish family of a man carrying a child at about 10pm on May 3, 2007, when Madeleine went missing. An earlier sighting by one of the McCanns' friends was dismissed as less credible after "serious inconsistencies" were found in her evidence. The report also raised questions about "anomalies" in the statements given by the McCanns and their friends. Exton confirmed last week that the fund had silenced his investigators for years after they handed over their controversial findings. He said: "A letter came from their lawyers binding us to the confidentiality of the report." He claimed the legal threat had prevented him from handing over the report to Scotland Yard's fresh investigation, until detectives had obtained written permission from the fund. A source close to the fund said the report was considered "hypercritical of the people involved" and "would have been completely distracting" if it became public. Oakley's six-month investigation included placing undercover agents inside the Ocean Club where the family stayed, lie detector tests, covert surveillance and a forensic re-examination of all existing evidence. It was immediately clear that two sightings of vital importance had been reported to the police. Two men were seen carrying children near the apartments between 9pm, when Madeleine was last seen by Gerry, and 10pm, when Kate discovered her missing. The first man was seen at 9.15pm by Jane Tanner, a friend of the McCanns, who had been dining with them at the tapas bar in the resort. She saw a man carrying a girl just yards from the apartment as she went to check on her children. The second sighting was by Martin Smith and his family from Ireland, who saw a man carrying a child near the apartment just before 10pm. The earlier Tanner sighting had always been treated as the most significant, but the Oakley team controversially poured cold water on her account. Instead, they focused on the Smith sighting, travelling to Ireland to interview the family and produce E-Fits of the man they saw. Their report said the Smiths were "helpful and sincere" and concluded: "The Smith sighting is credible evidence of a sighting of Maddie and more credible than Jane Tanner's sighting". The evidence had been "neglected for too long" and an "overemphasis placed on Tanner". The new focus shifted the believed timeline of the abduction back by 45 minutes. The report, delivered to the McCanns in November 2008, recommended that the revised timeline should be the basis for future investigations and that the Smith E-Fits should be released without delay. The potential abductor seen by the Smiths is now the prime suspect in Scotland Yard's investigation, after detectives established that the man seen earlier by Tanner was almost certainly a father carrying his child home from a nearby night creche. The Smith E-Fits were the centrepiece of the Crimewatch appeal. One of the Oakley investigators said last week: "I was absolutely stunned when I watched the programme . . . It most certainly wasn't a new timeline and it certainly isn't a new revelation. It is absolute nonsense to suggest either of those things . . . And those E-Fits you saw on Crimewatch are ours," he said. The detailed images of the face of the man seen by the Smith family were never released by the McCanns. But an artist's impression of the man seen earlier by Tanner was widely promoted, even though the face had to be left blank because she had only seen him fleetingly and from a distance. Various others images of lone men spotted hanging around the resort at other times were also released. Nor were the Smith E-Fits included in Kate McCann's 2011 book, Madeleine, which contained a whole section on eight "key sightings" and identified those of the Smiths and Tanner as most "crucial". Descriptions of all seven other sightings were accompanied by an E-Fit or artist's impression. The Smiths' were the only exception. So why was such a "crucial" piece of evidence kept under lock and key? The relationship between the fund and Oakley was already souring by the time the report was submitted — and its findings could only have made matters worse. As well as questioning parts of the McCanns' evidence, it contained sensitive information about Madeleine's sleeping patterns and raised the highly sensitive possibility that she could have died in an accident after leaving the apartment herself from one of two unsecured doors. There was also an uncomfortable complication with Smith's account. He had originally told the police that he had "recognised something" about the way Gerry McCann carried one of his children which reminded him of the man he had seen in Praia da Luz. Ce n'était pas la manière proprement dite, mais l'inconfort ou la maladresse que suscitait ce portage. Smith has since stressed that he does not believe the man he saw was Gerry, and Scotland Yard do not consider this a possibility. Last week the McCanns were told officially by the Portuguese authorities that they are not suspects. D'où vient l'insinuation que Martin S a changé d'avis. Qui a répandu cette rumeur dans les MSM avait une bonne raison pour le faire. Qui avait assez d'influence pour persuader ces derniers de l'imprimer ? Pourquoi aucun d'eux n'a vérifié ces propos auprès de Mr Smith, comme The Mirror l'a fait ? La BBC aurait dû rectifier lorsque, après la diffusion de Crimewatch, Martin S a protesté car il n'avait jamais dit cela. The McCanns were also understandably wary of Oakley after allegations that the chairman, Kevin Halligen, failed to pass on money paid by the fund to Exton's team. Halligen denies this. He was later convicted of fraud in an unrelated case in the US. The McCann fund source said the Oakley report was passed on to new private investigators after the contract ended, but that the firm's work was considered "contaminated" by the financial dispute. He said the fund wanted to continue to pursue information about the man seen by Tanner, and it would have been too expensive to investigate both sightings in full — so the Smith E-Fits were not publicised. It was also considered necessary to threaten legal action against the authors. "[The report] was hypercritical of the people involved . . . It just wouldn't be conducive to the investigation to have that report publicly declared because . . . the newspapers would have been all over it. And it would have been completely distracting," said the source. "Throughout the investigation, the Find Madeleine fund's sole priority has been, and remains, to find Madeleine and bring her home as swiftly as possible." 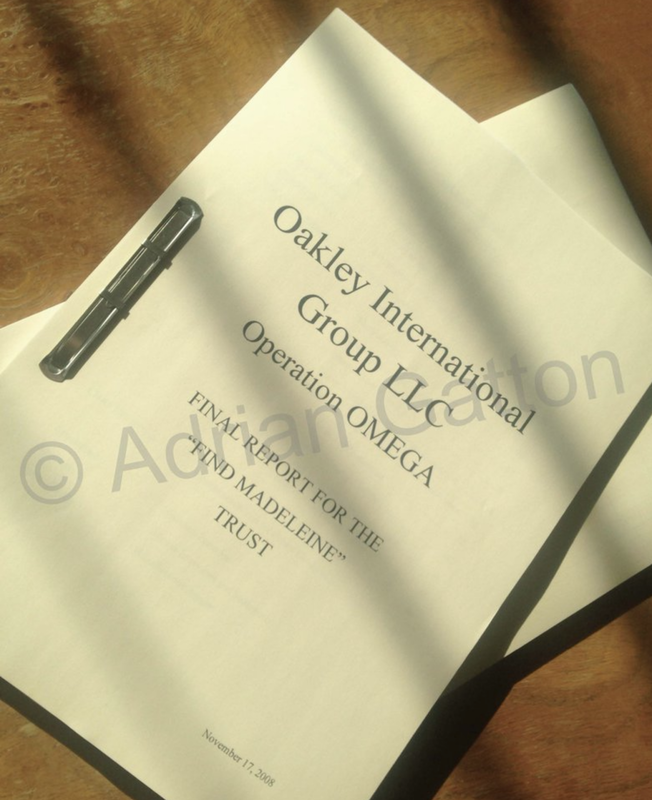 Le fameux rapport interdit de Oakley International (Operation Omega), il est daté du 17 novembre 2008. Le contrat (6 mois) de OI avec MF avait débuté fin mars 2008.